With its in-camera GPS, digital compass, wireless image and video sharing via TransferJet, accelerometer-driven panorama mode, and 1080i high-definition video capture in AVCHD format, it's easy to overlook the fact that the Sony Cyber-shot DSC-HX5V ($350 as of June 1, 2010) is, in fact, a camera. And it's an excellent camera, delivering some of the best image quality we've seen from a point-and-shoot model in 2010. The 10-megapixel, 10X-optical-zoom (25mm to 250mm) DSC-HX5V captured some of the highest-rated images in PCWorld Labs subjective tests for image quality, leading our most recent pocket megazoom test group in exposure quality and color accuracy. Sharpness and distortion levels were less impressive, and video quality trailed that of both the Canon PowerShot SX210 IS and the Panasonic Lumix DMC-ZS5, earning the DSC-HX5V an overall imaging score of Good. Here are sample clips that we shot in bright indoor lighting and in low light with the Sony Cyber-shot DSC-HX5V. For the highest-quality clips, select 1080p from the drop-down menu in the lower-right corner of each player. Though our lab-based imaging scores are impressive in their own right, they tell only half the story. When you get the DSC-HX5V in your hands and use it in everyday situations, you discover that this pocket megazoom boasts some of the most innovative and fun-to-use features available in a camera. It excels when shooting in low light without a flash, creating panoramic images, and correcting backlit images. Those key strengths are thanks to three modes, all of which you can access quickly via a mode dial on top of the camera: Handheld Twilight mode, which snaps up to six images at different exposure settings in rapid succession and overlays them to create a crisp, well-exposed photo; Intelligent Sweep Panorama mode, which lets you press the shutter button once and pan the camera across a field of view to create an instant panoramic photo; and Backlight Correction HDR, which takes backlit images at different exposure levels and overlays them to bring out foreground highlights. 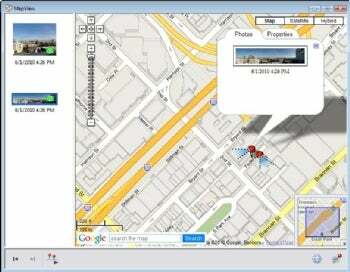 The geotagging works, but the function is tethered to your computer. Though the DSC-HX5V automatically geotags images as you snap them (as long as you're outside), you need to install the bundled Picture Motion Browser software on a Windows PC and offload the photos to your hard drive to get any use out of the data. Dragging and dropping photos onto the software's MapView interface correctly places them where you shot them (see below), but you don't get the same on-the-go convenience that you do with the GPS feature of the Samsung HZ35W. Battery life is solid, at 310 shots on one charge of the battery. However, if you use the DSC-HX5V with its GPS service turned on at all times, your battery life is bound to be affected significantly. For seasoned photographers, what's lacking from the Cyber-shot DSC-HX5V's bag of tricks are significant omissions: You can't shoot in RAW, and although the camera does have a full manual mode that lets you adjust aperture and shutter settings independently, it forgoes dedicated aperture-priority and shutter-priority modes. This is a camera designed more for casual photographers. Even so, the DSC-HX5V's image quality, low-light performance, and innovative modes are solid enough to entice anybody. The Cyber-shot DSC-HX5V handles SD/SDHC cards and Sony's proprietary Memory Stick Pro Duo cards (only one card at a time; a single slot in the camera's battery well supports either format). It's one of two Cyber-shot models that support wireless peer-to-peer sharing via TransferJet-capable devices. Not many TransferJet devices are available yet, however, and you need a special TransferJet Memory Stick card to share wirelessly with the DSC-HX5V. No doubt about it: The Sony Cyber-shot DSC-HX5V is a go-to pick for anyone who craves cool-factor extras backed by impressive performance. The DSC-HX5V is neck-and-neck at the top of our latest pocket megazoom cameras chart with the stellar Canon PowerShot SX210 IS, which might be a better choice for veteran photographers due to its aperture- and shutter-priority modes and sharper pictures. This story, "Sony Cyber-shot DSC-HX5V: Feature-Filled Pocket Megazoom Takes Excellent Photos" was originally published by PCWorld. Don’t call Sony’s GPS-enabled, feature-loaded DSC-HX5V a gimmick camera. It supplements its in-camera goodies with great image quality and terrific shooting modes.